Washington has repeatedly warned Ankara against purchasing the Russian S-400 missile defense systems, something that the White House said may prompt it to scrap deliveries of the US F-35 fighter jets to Turkey. 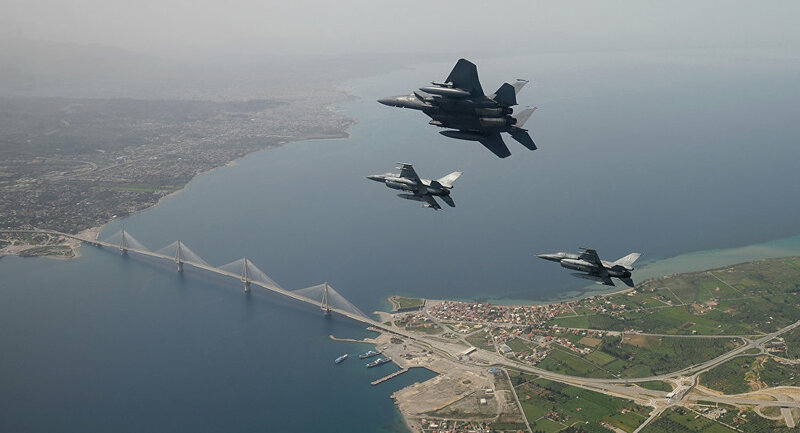 The Wall Street Journal has cited US sources as saying that the Pentagon is in talks with Athens to expand the US military's operations on Greek territory, in a "potential move toward the eastern Mediterranean amid growing tensions with Turkey." "There are both geopolitical and geographical factors that make Greece an appealing site for the US military," the sources said, referring to the current "apex" in Washington-Athens ties. At the same time, General Curtis Scaparotti, the current Supreme Allied Commander Europe (SACEUR) of NATO Allied Command Operations, who is at the helm of the talks, is not considering the deployment of American troops and military equipment in Greece on a permanent basis, according to the sources. Last week, Chairman of the Joint Chiefs of Staff Gen. Joseph Dunford told reporters in Athens that Greek officials are considering the expansion of US access to additional military bases in their country. Those officials "made a general overture, saying they would be willing to consider that, and I certainly was enthusiastic about the possibility," Dunford pointed out, adding that the US military has already "taken advantage of Souda Bay, a critical piece of infrastructure here in the region." The developments come against the backdrop of ever-increasing tensions between Turkey and the United States. The flare-ups have been high ever since US President Donald Trump recently authorized the doubling of steel and aluminum tariffs on Turkish exports, to 50 and 20 percent, respectively, after Turkey refused to release detained American pastor Andrew Brunson, who is accused of being involved in the failed 2016 military coup in Turkey. Adding fuel to the fire of bilateral tensions is Ankara's plans to buy Russian-made S-400 surface-to-air missile systems, which Washington warned may prod it to stop supplying the US F-35 fighters to Turkey. In June, the US Senate passed a bill banning the sale of the F-35 jets to Turkey citing Ankara’s planned purchase of two batteries of S-400 systems. Turkish officials have responded to Washington’s pressure by saying that Ankara does not accept sanctions from NATO partners when discussing deliveries of the S-400s.